"There is a large thunderhead building out over the ocean as the mid-morning sunlight invites you to come and visit the Point Arena Lighthouse on a perfect summer Sunday." Artist comment: "The Point Arena Lighthouse is one of my favorites. From time to time as I travel on the Coast Highway near Point Arena, California, I enjoy a short side trip to visit the lighthouse. I never fail to thrill at the first glimpse of that beacon standing watch over the rough waters of the Pacific. In this view, the thunderhead clouds were building far out over the ocean, yet the glorious sunshine touched the tower in the bright early morning. Long shadows fled over the adjoining buildings. I can still feel the warmth of the day. The painting was executed in gouache to reflect on paper the soft glowing warmth of that effused light. The scene is from the entrance gate, looking across to the complete tower and buildings of the Point Arena Lighthouse." 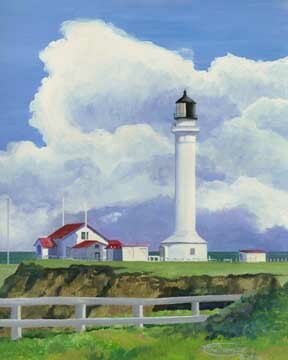 "Point Arena Lighthouse" is a limited edition, giclée print from an original pastel painting by Carol Thompson. The edition includes 3600 authorized, signed, limited edition prints (3500 numbered and 100 artist proofs). Release date is November 2002. Image size and substrates vary. All prints are signed and numbered by the artist and include a certificate of authenticity. Paper prints are shrink wrapped on foam board. Canvas prints are coated with a protective spray.